It's referred to as "The Disneyland of Walt's Imagination". It's the Walt Disney Family Museum's million-dollar masterpiece scale model representing many things built or conceptualized in Walt Disney's lifetime. And it's magnificent. The 14-foot diameter hand-crafted model is among the most elaborate and detailed scale models in the theme park industry. On a recent visit to the WDFM in San Francisco, I spent hours looking at this and could hardly pull myself away. It's a version of Disneyland that exists in no particular time period. To my knowledge, nothing here represents anything that originated after Walt Disney died in 1966. I guess if you were to assign a time period, it could be 1950s-1970s. Small and interesting details can be found throughout. Here, just beyond the castle gate, we see miniature figures of Walt and oldest daughter, Diane, entering Fantasyland. Cute little ticket and souvenir booths everywhere. Skull Rock! Chicken of the Sea Pirate Ship! The Fantasyland portion of the model gives us a good idea of what Fantasyland was before the big 1983 "New Fantasyland" makeover. Mechanized larger-scale "it's a small world" figures rotate on the model. Look closely at the Skyway buckets entering the Matterhorn from Fantasyland and you'll notice they're the old Skyway vehicles (1956-1967). Now look at the Skyway buckets entering the Matterhorn from Tomorrowland and you'll see they're the upgraded 1967 vehicles. Nice touch. It's Tomorrowland 1967 with some pre-1967 elements mixed in! Some things removed prior to the 1967 "New Tomorrowland" seen here are the Moonliner (rocket), Monsanto House of the Future, and the World Clock. And look at that. It's a representation of what eventually became Space Mountain. It's design was inspired by concept art like this and this. At one time the futuristic roller coaster concept was called Space Port and some concepts included ride track(s) on the exterior of the building as well as in the interior. Even though Walt died before the public opening of "New Tomorrowland" in 1967, he experienced some of the "new" attractions in one way or another. He, of course, rode Carousel of Progress at the 1964-65 New York World's Fair. 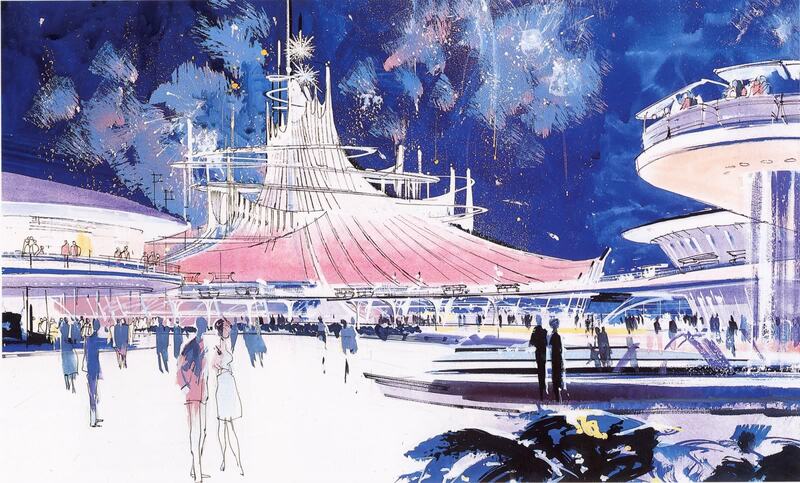 BONUS: Check out these mysterious details about an old Carousel of Progress RIDE concept. He also rode a Disneyland PeopleMover on an off-site test track. Now these (very cool!) little Flying Saucers also predated all the Tomorrowland 1967 stuff. Their location was later occupied by the Space Mountain complex (1977), but don't they look nice next to each other?? If only. Remember when there were TWO Autopias not that long ago? (Yeah, there were THREE at one time but that was long long ago). Until 1999, there was Tomorrowland Autopia and there was it's almost identical sister attraction, Fantasyland Autopia (previously called Junior Autopia). Tracks were later reworked and combined into the Autopia we have today. Fantasyland Autopia loaded near the Matterhorn, as we see here, and for a brief period of time it was transformed into the Rescue Rangers Raceway (yeah, I know) as part of the Disney Afternoon Avenue. Oh, and look. Some Motor Boat Cruise motor boats or "The Autopia on Water", as some called it. Much of the Motor Boat Cruise dock is still there. Go visit it while you still can. In Part 2, we'll explore the West side of the park. Major kudos to the model makers and consultants like Tony Baxter. It really is a model worth looking at for hours. I love the photos! I could probably spend as much time looking at this as I did looking at the Progress City model at Disneyland. The detail is amazing. I always dreamed that a real attraction would return to the CoP building and a model like this could occupy the entire upper floor. The credit for this model should go to Bruce Gordon, not Tony. It is one of the last things he was involved in before he died. Absolutely stunning! The amount of detail in that model is mind-blowing. Makes me sad for my childhood memories of the PeopleMover and Skyway. Great photos - thanks for sharing! I absolutely love this model! I love models of any kind, but when I walked into the room and saw this my jaw dropped and I was in heaven. Unfortunately this was a few years back, when they still did not allow photography in the museum. There were 3 separate museum workers surrounding the model to make sure no one took photos of it! Wow!!! Great pictures!! Waiting for part 2!! Is it safe to assume at this point that we will never see Part 2? It's sad, this was one of my favorite blogs but now it appears to be done. I have to echo Jake's comment above. It's sad that the Imagineering Disney blog seems to have closed up shop. I too looked forward to ever new insider articles and opinion posts. I was even looking forward to see if the Staff at ID had any opinions on the seemingly new direction Disney is going in regards to Marvel and Lucasfilm. However, it appears even this blog has called it quits. My goodness what an amazing model! A true Disney treasure! Like others have commented, I'd enjoy many hours exploring its detail! Please oh please, someday post Part 2 of this stunning article.